Hey There! For someone who really enjoys eating salmon, you’d think that I would have a salmon recipe on my food blog already. Not that I haven’t eaten my share of salmon since starting the blog seeing as how salmon has so many simple and delicious preparations. Well, I guess it’s better now than never to post my first salmon recipe. Without further ado (and no more rambling), I hope you enjoy this recipe for Maple-Soy Baked Salmon! Prepare the maple-soy marinade/sauce for the salmon. Full ingredient amounts and instructions located in the recipe card below. Place the salmon in a large resealable bag and use half the marinade (reserve the rest for later) to marinade the salmon fillets for 15 minutes. Lay the marinated salmon fillets on a parchment paper lined baking sheet. Bake at 400 degrees F for 10-15 minutes, until cooked. For this recipe, I used skinless salmon fillets, which have a tender, flaky texture, and mild to rich flavour (depending on type of salmon) when cooked. Plus, salmon is really good-for-you. It’s an excellent source of protein, omega-3 fatty acids (beneficial to your brain health), and a variety of vitamins and minerals like selenium, vitamin B12, and potassium. 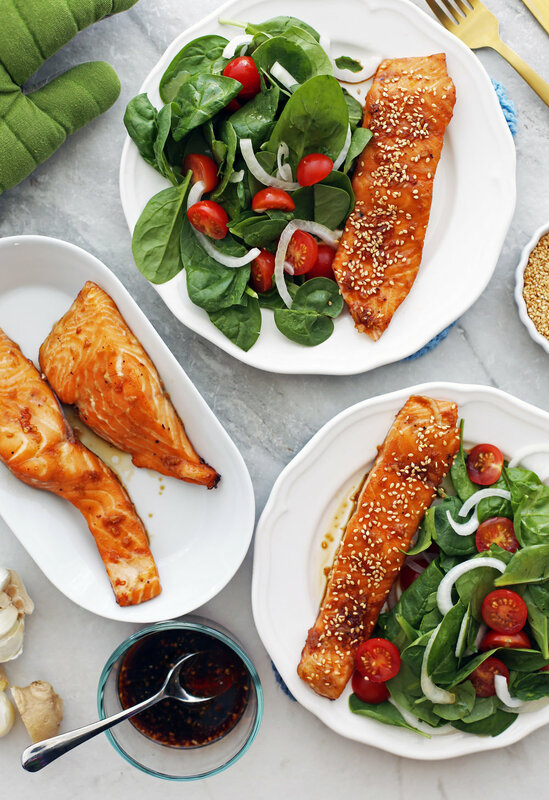 The salmon is flavoured with a super easy marinade that also doubles as extra sauce at the end and it only has six ingredients, two of which are pantry staples: salt and pepper. Plus, it comes together in just a few minutes. Just pour, chop some ingredients, and whisk together. The sauce is sweet and salty featuring umami-rich soy sauce as well as rich and sweet pure maple syrup. It’s a perfect match. The flavour is further enhanced with fresh garlic and ginger, which gives it a wonderful little spicy and pungent kick. Then sea salt and freshly ground black pepper are added, which makes everything taste that much better. The salmon is briefly marinated for 15 minutes with half the mixture (remember to save the other half to use as sauce in the end). While the salmon marinades, preheat the oven and line a baking sheet with parchment paper. Then, it only takes 10-15 minutes to bake depending on the thickness and desired doneness of salmon. You can check for doneness using a folk. If the salmon flakes easily (it should still be tender and moist), it’s done. You can also check the internal temperature using an instant read thermometer. The recommended minimal internal temperature for cooked fish is 145 degrees F (62.8 degrees C). 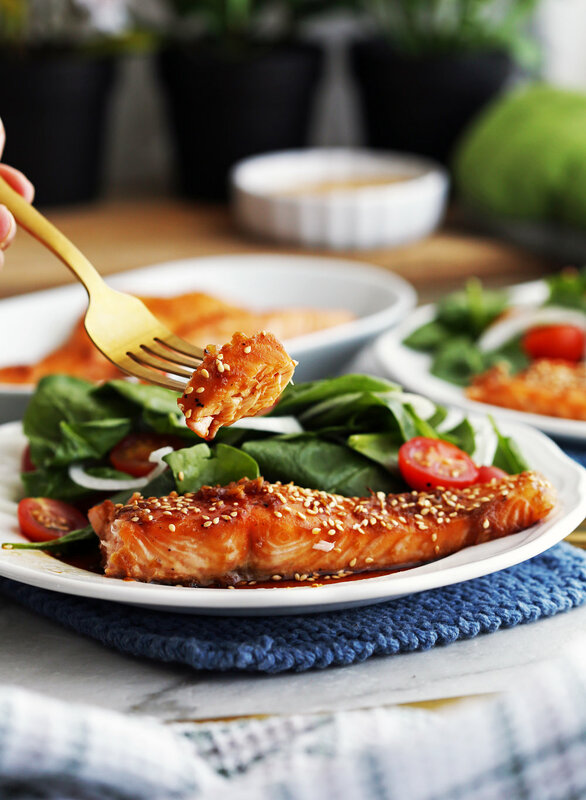 Finish by spooning the reserved sauce on top of the salmon fillets and then sprinkle with toasted sesame seeds for crunch. In a medium bowl, prepare the marinade by whisking together all the sauce ingredients until well combined. Place the salmon fillets in a large resealable plastic bag and pour half the marinade into the bag (reserving the rest), making sure that the salmon is well coated with the marinade. Squeeze out as much air as possible from the plastic bag before sealing. Lay the bag flat on a baking sheet (or baking dish) and place in the refrigerator for 15 minutes. In the meantime, preheat the oven to 400 degrees and line a baking sheet with parchment paper. Remove the marinated salmon fillets from the plastic bag (leave excess marinade in the bag for disposal) and place them side by side on the baking sheet. Bake for 10-15 minutes depending on the thickness of the salmon and desired doneness (the salmon should flake easily with a fork). Finish by topping the salmon with reserved sauce and sesame seeds. Best served immediately. *I used salmon fillets that were approximately 125g each.